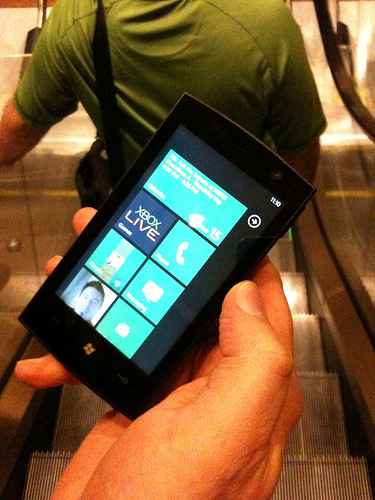 Rumor has it Microsoft will be jumping into the mobile phone market later this month. Much like Google's foray into mobile phones with the Nexus One, I think it's a horrible idea for Microsoft to sell phones, but according to this story in Barron's , that's exactly what they intend to do at a big launch party on April 12th. Like Google, Microsoft has worked hard to build a phone ecosystem around it's Windows Mobile operating system, and like Google (as I recommended in Nexus One Could Torpedo Google Android Strategy ), the idea is to let your partners build phones for you. When Microsoft (and Google) build a branded phone, what they are doing, is kicking their partners to the curb, a strategy that makes little sense to me. Microsoft has never done well in the hardware business, the XBox not withstanding. The Zune has been a dismal failure, a feeble attempt to compete with the wildly popular iPod. By the same token, Microsoft appears to be following Google and Apple in creating their own phones, and while they have every right to get into this business, you have to wonder if it makes any sense for them to do so. My friend and colleague John Blossom pointed out on Twitter recently that Microsoft deliberately hid its own brand when it launched Bing because of the negative connotations with the Microsoft name. If that's true, can you imagine how well a Microsoft phone is going to go over? Well as the old joke goes, about as well as a Led Zeppelin. According the to the Barron's report, the device is supposed to emphasize social networking and be aimed at younger consumers. My guess is Ballmer and the gang may think they can fool younger people into buying a Microsoft branded phone (or maybe fool their parents), but I don't think it's going to work. Microsoft for whatever reason has zero cool factor associated with it and I don't see how this phone is going to change matters, no matter how nice it may or may not be (and it's still just a rumor, lest we forget). I like to talk about the time years ago that Exxon got into office furniture. You probably don't remember because it was short-lived experiment. Exxon's an oil company. They have no business (literally) selling office furniture. By the same token, Microsoft is an operating system and software company. They are not a hardware company and they undermine their partner system when they try to sell a Microsoft branded product in this fashion. The phone market is already way over-crowded and it's unlikely Microsoft can offer anything close to what's being offered now. A better strategy would be to continue to encourage its partners to create this same style phone and stay out of the way, but for some reason, Microsoft seems incapable of doing that. Photo by Jeff Wilcox on Flickr. Used under the Creative Commons License. Microsoft is like Wile E. Coyote, always trying to come up with another device to stop the (Apple) Roadrunner. You forgot to mention PlaysForSure, which was Microsoft's first failed attempt against the iPod. Then Zune. Then Zune HD, which will soon be replaced by a new Zune device based on the WP7 OS. That's not to mention the failed Windows Mobile, and the coming Windows Phone 7 which will also fail, as it will be released in an incomplete state. I actually think making Zune a service is a smart move for Microsoft, but the phone is DOA. I don't think you need to worry about Microsoft steering clear of the mobile phone market, I'm sure the mobile phone market will steer clear of Microsoft. MS's foray into phones may not yet be a drowning man clutching at straws, but I think Ballmer et al. see the water coming up around their waists and are beginning to get a bit nervous about it. What with iPhone OS 4.0 coming soon and the iPad selling like hot cakes, they have reason to worry. Their credibility has been severely damaged by some very bad business mistakes; Vista, Playsforsure, the Zune, XBox and so on. They continue to be supported by corporate and government contracts, but that's eroding too. Linux is beginning to look really good. Poor beleaguered Microsoft. How does the boot feel on the other foot? Thanks for the comment. You make excellent points and I think you are correct about Microsoft grasping at straws for ideas to save their company. Thanks for the comment and the RT on Twitter. I appreciate both. Your RIM idea makes a lot of sense, perhaps too much sense. For whatever reason Microsoft seems reluctant to pull the trigger on big purchases. What next smartphone will dominate the mobile phone industry? Gorilla Glass: The answer to fragile TV screens?